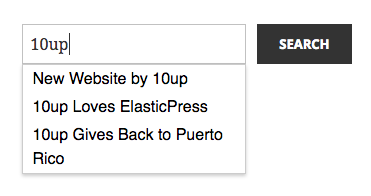 ElasticPress 2.4 has been released, bringing a new Autosuggest feature. When the autosuggest feature is enabled, input fields of type “search” or with the CSS class “search-field” or “ep-autosuggest” will be enhanced with suggested matches. As text is entered into the search field, suggested content will appear below it, linking directly to the content. Autosuggest improves reader engagement as visitors find relevant content faster. In conjunction with this release, we’ve also updated Debug Bar ElasticPress to version 1.3. The new version includes a Query Log page in the WordPress admin, which tracks ElasticPress queries and logging errors, facilitating more efficient debugging.